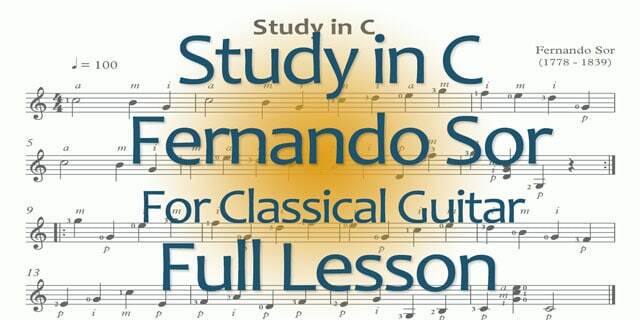 The Study in C, by Ferdinando Sor is a wonderful little piece for beginners. It also has opportunities for intermediate players to explore some specific musical issues, or to serve as an opportunity to practice your memorization skills. To start with, print the music and practice resource packet. (If you have created a free membership, you can also find it in the Member’s Area. The resource packet has the sheet music and TABs, as well as color-coded notes, small sections, and more. While going through the videos, take notes on the music. (Tip: As a general rule, use a pencil when writing on music). Don’t assume you’ll remember anything. If you think it’s worth remembering, make a note of it on the music. Even if you do remember it in the short term, you can’t expect to recall all the details if you re-visit the piece in 6 or 12 months. There are a few things to keep in mind when working on any new piece of music. To get the most enjoyment, satisfaction, and reward from your time on the classical guitar, it helps to have a larger, overarching goal. While it’s great to learn and polish a piece, there is a lot of time that goes into the process. First, know that your number one job is to notice and eliminate confusion. To truly notice where you have less than 100% clarity of every musical and technical detail (in both hands), you have to go slow and pay attention to every note. One of the great skills that we nurture in classical guitar practice is self-awareness and the ability to notice when we briefly pass through a “cloud of confusion”. These “clouds” can be very small: perhaps just an uncertainty of which right hand finger to play next, or what position our left hand should be in. If you play quickly all the time, you blow through these little confusions and they never get resolved. This is one way that we ingrain mistakes, and undermine our knowledge and memory of the piece. Whatever process you use to learn pieces like the Study in C, give each step it’s fair attention and time. I recommend starting with the 7-Step process to learn pieces. But as they say, there are many ways to skin a cat (if that’s what you’re into…). While each step may only a minute or two, if you rush through any one of them, the integrity of your entire work is weakened. If you later find (because you notice these things) that you are not entirely clear of some aspect of the piece, take the time to revisit that part of the process. Most people just keep repeating mistakes, hoping they will magically go away. Practicing mistakes just ingrains the mistakes deeper into our muscle memory. Like a drop of coloring in a clear pitcher of water, each repetition of a mistake only discolors it more. The only way back to “clear” is to dilute the stained water with more clear water. This way, our work is manageable and we get the gratification of completion in our daily work. Working intensely with small sections also leads us to memorize the music to some degree without even really trying. We just know it after exploring fully. For each section, as you begin working on it, make sure that you know all the notes and musical markings, and that you can clap the rhythm while counting aloud. Note on Memory: If you go into your work with the intention to memorize the music, your mind will pay more attention and will store it more effectively. Just as if you know that you will have to teach something you learn to someone else, you learn it better. Once in a while, look away from the music and have a go at playing it from memory. Just for fun. This will speed up your learning process, and just may surprise you! While playing the hands separately is not the easiest thing in the world, it sure does simplify your work and clear up much of the confusion you may have. Start with the right hand alone. This means you’ll only hear the open strings sounding. The point is to learn the right-hand fingerings, and notice the string changes (i.e. “I have 3 notes on this string, then 2 on that one, then back for another 4 notes….”). In the resource packet, I included a color-coded copy of the music, with each color representing a different string. You can also see the string changes in the TAB. Bonus Points: See you can look away and do this step from memory before moving on. Then the left hand by itself. Of course, this will sound like nothing, because your right hand is not playing. That’s okay. Just do it. Count aloud while doing this one, to keep everything in rhythm. Before moving on, take a spin at doing this step from memory. Now that we know what our fingers are doing, we can make this bit prettier. “Dynamics” are swells and fades, louds and softs. Lines going up get quieter. Lines going down get louder. There are a couple of other musical “rules” in the video as well. If you like, note them on your score (sheet music). Last note: When you find chords in the music, such as in bars 7 and 8, put your left hand fingers on the whole chord when possible and let the notes ring out over each other. This makes it more beautiful, and simplifies the left hand. The same rules apply for dynamics, but things are a bit more complex in this section. Here we have a melody and accompaniment intertwined into one line. The trick with this sort of writing is to decide what you’re going to call the melody, and play everything else quieter. This will tell your listener what they should be listening to. Again, this is all about eliminating confusion. Even if you go back and change it later, make a decision (even if it’s wrong) on what is what and how you will play it. The point is not to be right. The point is to nurture the habit of making musical decisions and paying attention to details. If you get confused, great! That means you are stretching yourself. Like any puzzle, keep at it and have fun with it. With practice, your fingers will do just about anything you tell them to do. The trick is knowing what to tell them. For this, put down your guitar, raise your music stand, stand up, and take a deep breath. Go through the music, singing along, or counting aloud, and exaggerate all the dynamics. Sing and conduct (wave your hands around and express the music with your entire body). It’s okay if this feels funny or silly at first. Do it anyway. This is where the magic happens! If you can go through the section or the piece in consistently the same way, you’ll have to have made decisions of what gets louder, what gets softer, how fast the music goes, balance, and a number of other things. Any questions about the Study in C, how to learn pieces, or any part of this? Ask in the comments section below! After learning this piece and going through this process, share your observations, trials and triumphs, and anything you deem noteworthy in the comments below!